Legislative history can be a complex area to research, and librarians often suggest starting with a secondary source. 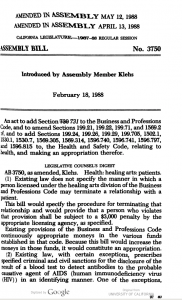 In California, that can include the January issues of the University of the Pacific Law Review, where new state legislation has been summarized every year since 1971. Next PostNext Public Access to CRS Reports – Finally.